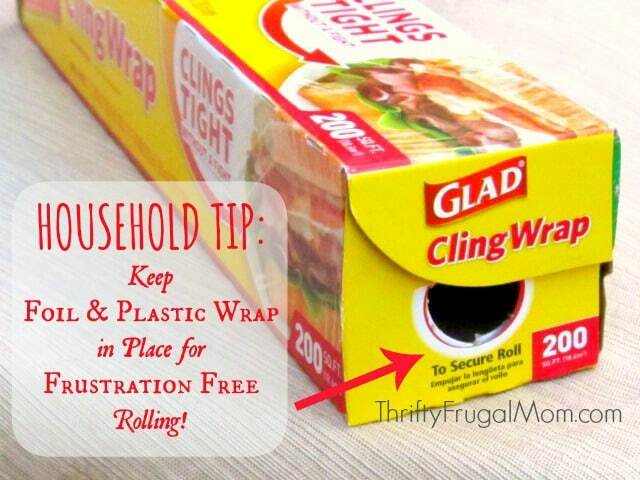 Tired of your plastic wrap rolling out of the box when you are using it? This simple kitchen tip will end that annoying problem and make your life just a little bit easier! Have you ever tried to cover something with plastic wrap, only to have the roll full of plastic keep trying to hop out of the box? Yeah, me too. Talk about frustrating! Well, a couple of years ago I happened to notice something that has made a world of difference and allowed me to use plastic wrap pretty much frustration free. If you look at the end of the plastic wrap box, you’ll see there are little tabs that you can push in and sort of lock the roll in place. That simple and bam- no more plastic wrap rolling out of the box! Turns out aluminum foil boxes have them too. Please tell me I’m not that only one who didn’t know about these handy little tabs! Makes me wonder what other simple little instructions I am missing that would make my life easier!